The Oil Spill Tracker is now enjoying a well-deserved retirement. SkyTruth created Oil Spill Tracker in 2010, with support from Surfrider Foundation and Ocean Conservency. It was created to fill the information vacuum that was created by the government and the BP-driven spill response process in the aftermath of the BP Deepwater Horizon oil spill. Interested citizens and organizations tracking the impact of the oil spill on the Gulf coastline could submit incident reports with text and images, and include links to news articles and video.Our Oil Spill Tracker tool (built on a crowd-sharing platform called Ushahidi) displayed the reports on an interactive map where anyone could view them, and sent out alerts to people who had signed up to be notified about them. 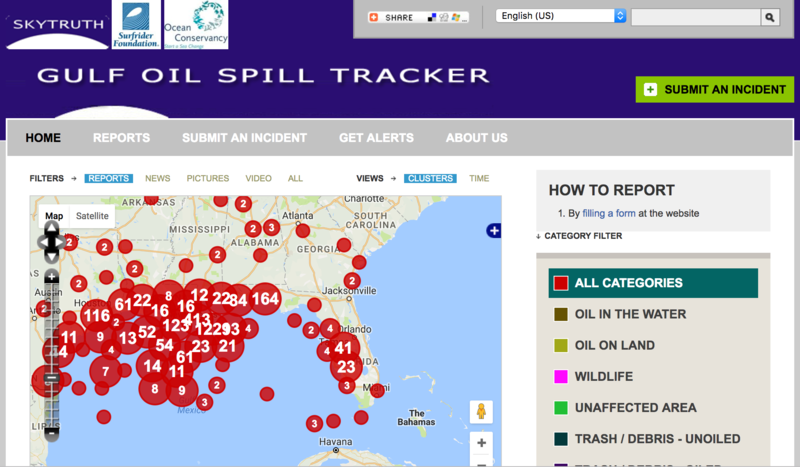 Over 400 citizen reports were uploaded during and in the aftermath of the spill. Users included concerned citizens around the world, government officials and staff from the local to national level, and members of the media. One of our diligent users, Susan Forsyth, told us the citizen-submitted reports of continued oil spill impacts on the beaches of Florida played an important role by keeping BP and the US Coast from prematurely declaring victory and suspending their cleanup operations there. Florida state officials were thankful for that. A reporting mechanism specifically for the Deepwater Horizon spill is no longer needed, so we’ve retired Oil Spill Tracker as of April 24, 2017. The Louisiana Bucket Brigade (LABB) tracks pollution in the region with its iWitness Pollution Map, so head over to their site if you want to continue submitting reports. And of course we continue to operate SkyTruth Alerts, which publishes official reports of oil and hazardous materials spills nationwide that are collected by the National Response Center. If you would like to help SkyTruth build more citizen scientist tools like Oil Spill Tracker, please consider making a donation!